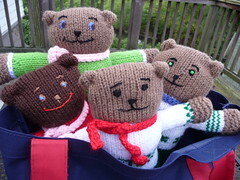 It's "un-bear-able" how cute these are! I have a youtube video showing how I do inside out double knitting and used the foot of a bear I had just started as an example. Recently a youtube viewer inquired about the pattern which of course I have partially in my head and partially on paper. So I gathered everything I have and tried to compile it into a somewhat brief description of how the pattern goes without getting too specific (shocking... I know!). I uploaded the information as a PDF which can be downloaded/viewed HERE.